The weekend is over and a new week rolls out like a red carpet in front of you. Time to put on the pretty shoes and walk with confidence toward the week ahead! Here's a beautiful flower just for you! Betty is doing a dance of joy because it is Persimmon season here! I love these little gems! Here's another shot of that mystery flower. Can you guess the name of this exotic beauty? If not, can you make one up? 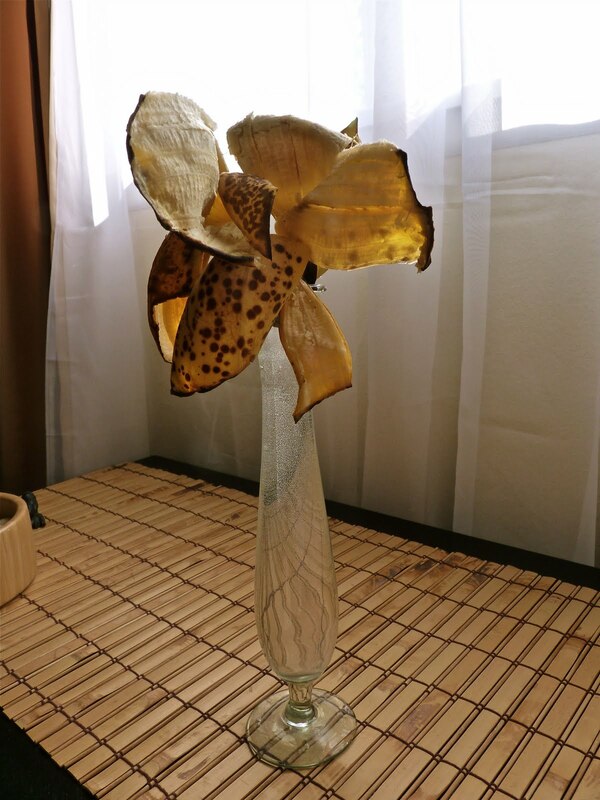 As for the mystery flower, when I first saw it, I thought it looked like palm bark that had been peeled off, dried, put into a vase and passed off as a flower. How's that for a name? I don't know what it is, but I'm going to call it a Leopard Lily because it has spots like a leopard. :D Happy Monday to you, Betty! Is it maybe an orchid of some kind? I agree with HulaBuns and I love persmmons but ours does not bloom or bear fruit....ah well. Hm. I'm think banana peel, too. Ya got me. I have to put persimmon on my list of things to try. I like most fruits... most things actually. I don't think I've ever seen a persimmon, though I've heard tell. Maybe at the Mexican market? Lately, I've been all about the pears. That's what we've got right now. Very odd we can see the first flower picture and persimmons pictures but we cannot see the mystery flower. Blogger is a freakoid sometimes!! I have never heard of a persimmon before let alone eat one. Love the perspective on the persimmons. Good morning to you too lovely BB!!! And erm persimmons look like sharon fruit - are they?!?!? Great pic of them!!! It kind of looks like a dried cymbidian orchid to me, but... what do I know. Would you believe I've never had a persimmon? I wouldn't even know how to eat it if I had one in my hand! is it a bananna blossom? 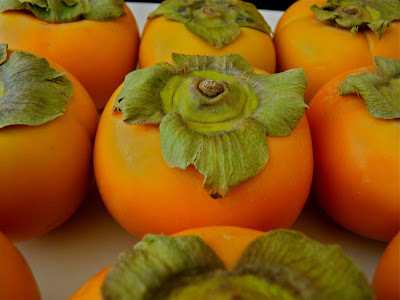 I've never had a persimmon either if you can believe that... what do they taste like? I've never had Persimmon before. Looks interesting! The only persimmon I've seen down here is elongated and sour. The flower...how about 'butterfly flower'. It is a beauty, unusual. I never liked persimmons by my mom grew up with them and adores them so they remind me of her! I'm gonna call that flower the "BananaPeelMakeover"
I confess that I've never seen a persimmon before, and am not really sure what you do with one. However, that first flower??? That's a real flower and not a clever decoration? I give up, I don't know what that flower is either, but it sure is interesting looking! Ooooo, what a lovely flower. Throw a little chocolate on it, and I might eat it! (I love chocolate covered banana's, don't you?) Is it a banana-lily. Or maybe an ape-lily. Hmmmm . . .can't wait to find out! Yeah, I'm joining the banana peel party. I didn't want to insult your flower if it really was an exotic beauty, but looks like I'm not alone. Have you ever had native (as opposed to Asian) persimmons? We didn't know what the fruit on the tree in our park was until it ripened and we googled it. The thing's only fruited once in the 4 years we've lived her. The smell of the fruit pulp was divine! Is it some kind of an orchid? I haven't had a persimmon. What do they taste like? I'm guessing it's a banana orchid. I always sit next to Old Kitty when it's test day. She's super smart. 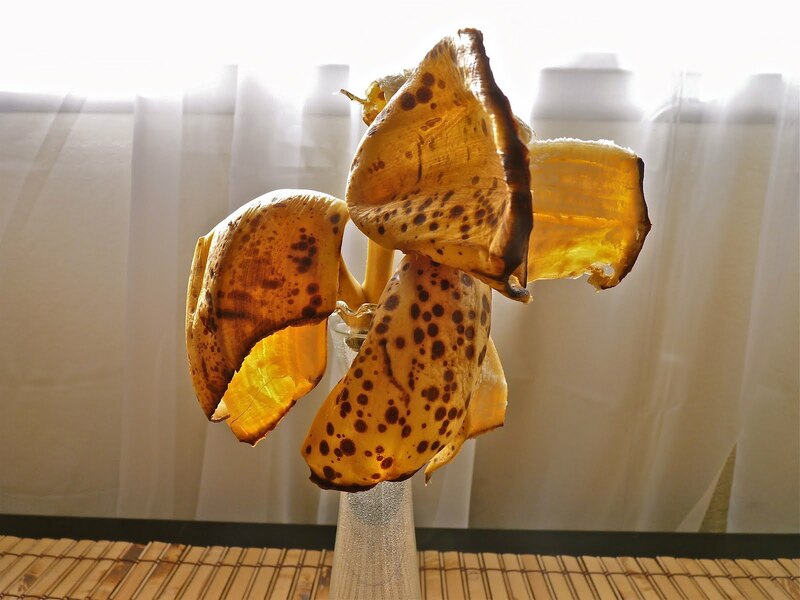 I thought you had created banana peel art with that flower! I've never tried a persimmon either. Now I want to. Maybe you can enlighten us as to the joys of the Persimmon. I, for one, just don't get it. All I've had are some bland mushy cookies. Guide us, O-Bossy-Wan, guide us. Aren't persimmons those very mouth-drying fruits? How are they supposed to be eaten? That last flower looks like the lovely, ornate CHIQUITA flower. Of course, it could be CHIQUITA's ugly cousin, DOLE. Good morning Betty! I am not good at identifying flowers. So in this case I will make one up. It is a brown spotted mustard wing butterfly flower...at least it is to me. I have to confess I know not what a persimmon is nor do I know what that flower is either. But I love your photos! It's actually not a flower, it is three of the random and seldom seen bananapeel butterflys at rest. Loooove your variation on the flowers this week. Very festive and delicious! Did you steal the very rare flower from Phipp's Conservatory? The one that smells like rotting flesh? I'm afraid that the shoes I put on this morning were not very pretty but what can ya do. That flower is the rare and beautiful yellow spotted whatchamacallit. Wherever did you find it? That is what I was going to guess. The rotting flesh flower! Ewwwwwww! knee deep in Halloween peeps. Persimmons. I've heard of them but don't think I've ever had it before. Now I want to try it! Great quote to start the week with! Thanks! Is the top flower a banana peel??? Beautiful and unusual looking flowers, have a great week! I like your turtle picture. I had two red-eared turtles that my husband and I had to release when they got too big for their largest tank. We let them out at the Bronx Botanical Gardens. Okay, so I don't feel so bad when I'm reading that some people are naming that flower with the word "banana peel" in it. I clicked on your blog and started to roll down the page. I just saw the top part of that flower and it looked like you took a picture of a banana peel that was being flung across the room and I thought, "WOW, what GREAT photography!" Then I saw that it was in a vase and said, "HUH?" I've never had a Persimmon before. I don't think I have ever even seen one before. Is it a fruit or a vegetable? Tonari no kyaku ga yoku kaki kuu kyaku da. I don't know what it is, but it's Monday evening and it still looks pretty! Those persimmons are like a work of art. I have no idea what kind of flower that is, but it looks like it would be a Tiger Lily if I've ever seen one, beautiful with a dash of roughness to it. Love the persimmons! Also the sunning turtles (are they new?). As for the flower, I am guessing that it is some sort of orchid. How about leopard? Or jaguar? 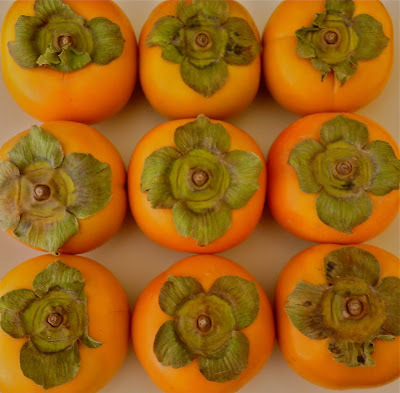 I've never had a Persimmon ether...how do eat it? Love the flower....had me going until I looked closer...think a monkey would love a bunch of em. I'm 41 years old and I've never seen a persimmon. How can that be? Well, thank you for the pictures! Oh Betty! 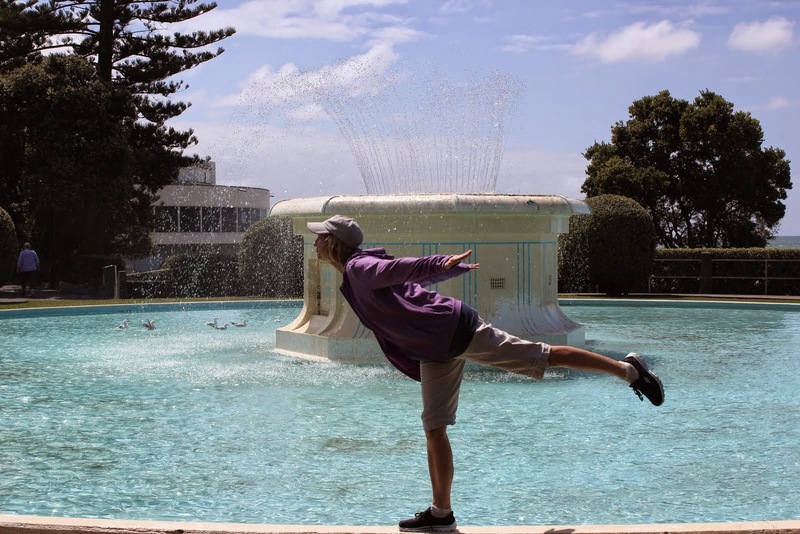 Thank you for the persimmon picture! My parents pulled a fast one on my brothers and me years ago. Have you ever tasted a "green" persimmon? As in not yet ripe? Quite puckery. The only way I can describe how my mouth felt is to imagine a cartoon character whose cheeks are sucked into his mouth and he cannot unpucker them AT ALL. I don't remember what the "antidote" was to relieve the feeling but I chuckle at the memory of Mom and Dad laughing at our reaction (because they KNEW what would happen)! It seems as if they offered a ripe one next to let us know persimmons could be quite tasty. I don't really remember the flavor of a ripe persimmon but I sure do remember the "green" persimmon! and the fruit I wonder how it taste...hmmm...but looked yummy!! I've never had a persimmon in my entire life. I can't believe it. Am going to go hunt one up at the market if I can. Anyway, they're really pretty, aren't they? I love to eat persimmons. Those we get here come from China and Israel.